So, I’m back, much more rested, rather than how I was the other night when I wrote my last post. I’m ready to write some more. I need to write more. In looking at things I’d touched on the other day, I decided I’d start with Dungeon World, even though FATE has been more on my mind. I simply feel it’s a better subject to start with. I’d start with the GameMaster, but outside of feeling he did a fine job, I don’t have a lot of commentary to make about him. With one exception, and this may be a rules issue. He said there wasn’t an initiative system in the rulebook. As I haven’t read the book yet, I can’t say he’s wrong. However, it’s not a surprising idea, and I personally don’t care for that kind of a rule. I’m typically a polite player. If someone starts speaking before me, I’ll wait for them to finish. With an initiative-free system, those who are louder or more talkative get more screen time, and more actions. Because without initiative, and a “players only roll, GM reacts” system, whoever speaks acts, and they can continue until the GM decides to stop them. Our GM did a fair job of that, eventually realizing that some of the players were dominating play, but that initiative is not mandated, I could easily see some players eventually becoming very displeased with the game. A personal issue I had is one that comes from what I can only dub “Con character creation.” We created our characters on-site (the quarterly RPG meetup at our FLGS). Character creation is easy and quick. However, our characters were created at higher level and our choices didn’t come from organic growth, just what we felt interested in. I made my character a buffer almost totally, which led some of my actions being wasted. The buffs I could throw only lasted one action, and there were times I threw buffs on characters who couldn’t or didn’t attack (none of my buffs were defensive). So, the powers available based on class are extremely limited, but also extremely effective. I was able to create some massive damage bonuses with the way powers stack. For my purposes though, I think the system is some what lacking, and maybe a little too crunchy. There are “moves” (the DW jargon for “powers”) for setting up camp and other mundane actions. The classes are d20 standards, which I’m not crazy about. The bonuses are based on Moldvay Basic D&D, but that works for a 2d6 system. Sadly, it makes the 3-18 spread even more useless than recent editions of D&D. Everything for any character class is on that class’s specific character sheet, except the spell casting classes spells (which live on additional sheets). It’ve very compact in that respect. At some point, I want to really read the game. I don’t know that I’ll be using it ever (in fact, I sincerely doubt it), but I’m interested in that “no-initiative” rule, as well simply exploring different rules sets. It seems it’s been very popular right for quite a while on DriveThruRPG, and I’m sure it’s perfect for some players and GMs. I just don’t think it’s my cuppa. On a different topic, the Boy is looking to play some kind of Warcraft-like game, so I might be delving into board game design with him. I’m going to have to ask him more questions regarding what it is exactly he wants to do. It may be that he wants me to play an online game. If that’s what we’re doing, than life will be a lot easier. 🙂 Otherwise, board game design may become a topic of discussion on this blog. That’s all I have on that for now. I’ll be working tomorrow, and I doubt I’ll be posting afterwards. But I’ll be questioning a Boy on what we’re doing, and letting you all know hat’s going on. I’ve decided to put up a little something, as it’s been about a week since I last posted. However, I’m really tired for some reason tonight, so I think I’ll be brief. I still want to write about some of my experiences driving. I just haven’t been able to get anything noted to move forward with that. When I’m driving, I can’t really make notes, and when I’m not driving (even as a passenger at work), I’m not thinking about it from the driver’s point of view. I didn’t mention that a couple of weeks ago, I got a chance to play Dungeon World, an RPG that mixes OSR simplicity with d20 and Apocalypse World. The OSR and d20 portions don’t really do much for me, and again, I’m just a little tired to get into it too deep right now. I’ve managed to read through all of the FATE books. I’ve enjoyed them a lot, and I’d like to review them. Again, I’m tired and not thinking clearly, so I’ll try to get back to that. Finally, I received a lot of comments on Facebook regarding my last post. I feel a need to clarify something that came out in a couple of the comments. Primarily, what struck me is that it seems, even to my own eyes, like I’m talking about giving up drawing and illustration. I’m not, at least for myself, but I think I am going to take an extended break from even trying to draw, and I’m definitely going to stop looking for/at any kind of drawing/illustration work. That’s what I needed to put out into the world. I needed to make that real. I needed to tell myself to focus my energies elsewhere, rather than focusing on something that frustrates me in a bad way. We all know there is good frustration, but that’s not where I’m at with my art. Doing this has helped me come to some realizations as to what I’m looking for for work, which is really steadier part-time work, or work with downtime that I can use for my own creative projects. Well, for now, I think I’m tired and done for now. Later. I think it’s time to admit, if only to myself, that I am no longer an artist. Maybe it’s just frustration that leads me to write this, but it is indeed a fact. It’s not that I have, by some weird twist of fate, forgotten all I’ve learned, lost my talent, or some other strangeness. I simply don’t create much (hardly any) of my own art any more. I look at art, spending hours looking at professional artists’ sites, including (and especially) DeviantArt, but I can’t find whatever it takes to complete anything of my own. I’m just not driven to draw or paint like I was in the past. Obviously, this bothers me. I’m just not sure I want it to change, either. I’m not sure when this started. Probably around 2006 or ’07. I know I first noticed it around that time. For example, a lot of the imagery that is inspiring some of StarSea was created between 2003 and 2005, when I was working at a call center. However, in the past couple of years, I’ve only completed one piece of artwork, a character portrait for D&D. And it’s not my GMPC that I played in my Invasions campaign that I just completed. I tried to do something for that character, and I could never get things right. I couldn’t find a way to make his armor or his weapons look like they belonged to him. In said game, I came to rely on images from the Internet to show the players, rather than draw my own stuff. I know that, while working at the photo studio (2006-2011), I noticed I wasn’t completing sketches I started at work. I have a lot of skeletal drawings that I never completed, and probably never will (including that GMPC). In that time, I also cut back on the comic books I was buying, especially the Big Two. I got to reading more, I think, especially on the Internet. I know I was reading a lot of 4e books at that time. But since? I’m not buying any comic books any more. I can’t really afford it, and even if I could, the Big Two have left me in the dust, and only some of the indie stuff really ever caught my attention. I’ve been asked to do creative work in the past few years (including some stuff for the FLGS), and I’ve let it all fall through the cracks. I’m just not interested in or inspired by the stuff I do, for the most part. I’m to a point where even the stuff I do for myself is generally unsatisfying. I’m just not interested or inspired by my art enough to complete it. Part of me is frustrated by that, and part of me thinks maybe it’s a natural evolution. Right now, I’d like to put pencil to paper, but I have no idea what I’d do other than just scrape a pencil back and forth across the page, making nothing. Some of this is coming from something that struck me earlier. I found that someone had a link on Facebook to a local studio that has done some really interesting installations locally and elsewhere. I thought “That would be a neat place to work,” and then I thought “But I don’t have a portfolio any more, and creating one would be a big frustration…” for the reasons I’m discussing here. You can’t make a portfolio on incomplete pieces you’re not inspired to complete. On that idea of evolution, I know that recently, I’ve wanted to save up for an iPad Mini. I want something portable I can carry at work easily. I’ve already earmarked a couple of drawing programs, but what I really want it for it to read and write. Maybe that’s the direction I should be going. Or maybe I’m hiding from these facts I’ve mentioned by trying to be creative in a different direction. A few years ago, while at a meeting for a Renaissance Faire group, I was sitting drawing and one of my closer friends made a remark that I was denying my calling by not working as an artist. Maybe it’s the monkey put on my back by my father, but I’ve always felt I need a day job while doing the stuff I love. Recently, I’ve been wondering if my art work hasn’t been a denial of a calling. When I was a teen ager, I wanted to be a comic book artist. I sent off a few submissions that got me canned rejections. Within a couple of years, I stopped. It wasn’t until I was nearly 30 that I think my skills got to where I might have been good enough for the industry, but by that time I had lost interest. I think that storytelling is more my calling, and I’m still searching for a way to do that in such a way I can pay my bills. I’m kinda running out of steam here. I was pretty irritable when I started this, and that’s now faded. I have no idea if I’ve conveyed my thoughts well. That may be because I’m not 100% sure where I’m going with this. I’m going to go ahead and make this public, even though it may be something I should keep to myself. I think I want the reading brain trust to make comments, and maybe the comments you readers make will give me some ideas. My work week was better this week. I worked nearly 30 hours, which helps balance for the skimpy week prior. On the other hand, I also had plenty of time to read while riding. As I said to someone the FLGS RPG Meetup on Saturday, FATE has proven to be a really interesting game, so much so that I’ve been reading every book I’ve gotten a hold of cover to cover with speed. Savage Worlds, Numenera, a couple of others, have just not grabbed my interest like FATE. Something has stopped me up with both those games, as well as others. Some rules hang up, or finding myself in a dull chapter, or something along those lines. Now, FATE isn’t perfect. I’ve got my own confusions and concerns, and I’ve read some criticisms of the system. Most of them aren’t balance issues. In fact, as far as the dice are concerned (and most of the criticisms), the game is almost too balanced. So, I’ll go in knowing the problems ahead of time, if I choose to use it for my game. My biggest concern is the kids. I have to young children in my usual game group who won’t be as accepting of the idea of “failing forward,” which is very present in FATE. I also think they’ll have a lot of trouble with the idea of aspects being two-edged swords. This would be my major road block for using FATE. Needless to say, outside of thinking about how the rules of FATE would work to build the StarSea in, I haven’t given the StarSea itself a lot of thought lately. Too much reading, in a good way. I still want to dig through the FATE books a little more, and read a few other systems, as well as another examination of the Chainmail rules that came out in the D&D 3.0 Era, and the D&D 5e playtest, before I make a final decision. I think once that’s done, I’ll be ready to start really writing material for a campaign and world book. That’s all I’ve got for now. It’s late (or maybe early? ), so I’m heading off. Later. 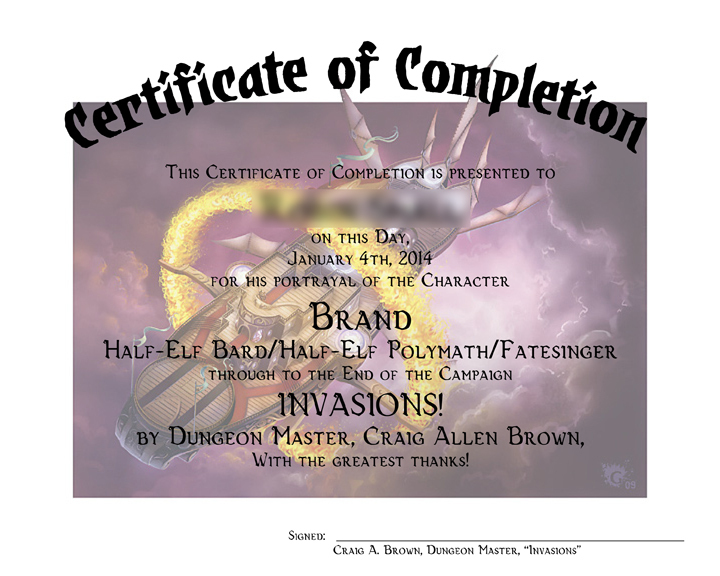 So, last night I completed my D&D4e “Invasions!” campaign. The PCs were “Big Damned Heroes,” saving reality from Tharzidun (AKA Tharizdun, the Chained God) by doing what the gods before them couldn’t, by laying a smack down on the Mad God. This was followed up by a montage/slide show in which I described the fates of all the PCs, past and present, as well as NPCs and the future of the world for the next few hundred years. I then handed out to each player a personalized version of the certificate above, as I have never before completed a campaign. We followed that up with some discussion on our characters for the next campaign, which will be run by the player of Brand, a D&D4e game set in the Moonshae Isles of the Forgotten Realms. That before now I had never completed a campaign sticks out in my mind. I have run a number of campaigns, but I’ve never brought one to it’s natural conclusion. My D&D 1e and 2e games, Champions and Villains & Vigilantes games of the past were never completed, usually because they were connected with college or something like that, friends moved, etc. Even my recent “chronicles” in Vampire the Masquerade, Mage the Ascension and D&D 3.5 simply faded away from players moving, children coming into players’ lives and other issues. I did one short campaign when a friend moved back into town from Missouri, but it was only intended to run a few weeks while he was visiting, so it had a built in (but ultimately unnecessary) deadline. (That game had elements that are being resurrected in the StarSea, by the way.) This was the first one that I planned an ending to from Game One, and which came to the conclusion it was planned to have. A kind of melancholy struck me this morning, as I started archiving my game notes. I had 11 GB of stuff on my laptop’s hard drive, most of which I didn’t use much. The moving and sorting out which things I wanted to keep in easy access (mostly image files, but a few others as well) brought back memories of the start of the campaign, and how I was in a better place in my life when I started the game, even though it was shortly after my father died. I could take you all to quite the pity-party on this, but I think I’ll spare you all. Suffice it to say that I’ve seen better days, and 2014 isn’t getting off to a good start, emotionally or financially. On the other hand, again, the Kindle has been a boon. I’ve been reading the FATE Core and FAE books on the Kindle while riding around at work, as well as having picked up the Toolkit book and a FATE Worlds book, which I read at night before bed. I’ve been getting ideas on how I might make the StarSea work in FATE, so it’s well in the running for being the rules I’ll choose. Something I’m noting on a very metagaming level is that FATE could very well operate on a metagame level, being a system GMs and players use to create worlds and define characters, and then a different system could be used for actual play, although I’m not sure why someone would. This version of the game is a vast improvement on the old version I read some years ago (before 4e came out, as I was discussing it with an old friend well before he left town). Examples of how the system works are much better than in previous editions I’ve read (I haven’t read Spirit of the Century or the Dresden Files RPG), however sometimes I do find myself confused by some of the terminology, as the idea of aspects can be rather broad. One of the other things I’m liking about FATE is that it very much is geared towards fitting the game to your idea, rather than the other way around. I’ve so often tried to force ideas I’ve had into a game mechanic and had it frustrate me so that I end up loosing interest. I don’t think that’s possible with FATE. For all that, it’s still no guarantee I’ll use it, in the long run. I caught a video review of the Radiance RPG, which I’ve mentioned before. It seems to be a streamlined version of d20 with some 4e ideas (the reviewer thought many of the 4e ideas in the game were novel and unique, so he’s obviously never really read 4e, even though he’s a bit of a grognard) with a fantasy steampunk setting. It’s on my list as well, so it’s a system that will definitely get some discussion here. Also, this week I’ll finally get back to my Living Forgotten Realms game. Between illness and holidays, it’s been a month since I’ve played (or nearly so). It will be good to see that group again. They are mostly much younger than me, but that’s a positive in my book. I’m still coughing a bit, but I haven’t had a coughing fit that’s stopped me in my tracks for a week or so, and that’s progress. Sorry to be abrupt, but that’s all I can think of to discuss for now, so I’m signing off. Later.